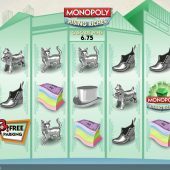 Monopoly Rising Riches slot is one of a series of Hasbro Licensed games based on their board games. Other titles include Monopoly City Spins and Battleship Wild Targets. As the name suggests we have a slot based on the famous Monopoly game and all the icons reflect this; the silver boot, Free Parking logo, banknotes and Pass Go, of course not forgetting the little rotund chap in the black suit and bowler hat - Mr. Moneybags! The game is essentially a simple one and has no bonus round. There are 25 pay lines on a 5 reel and 3 rows format and we have the jaunty jazzy musical overlay along with simple sounds when wins occur. The only difference to a standard slot is that we have a 'cascade' mechanism whereby all winning symbols disappear and are replaced by more dropping from above thus giving the possibility of successive wins - made popular by slots such as NetEnt's Gonzo's Quest. The good thing here on Monopoly Rising Riches is that each successive win increases a win multiplier on the right of the reels as so: 1, 2, 3, 4, 5, 7, 10 and 20x and not only that, but should you reach the 7, 10 or 20x multipliers regardless of any win amount you also get credited with a cash award of 5, 10 and 25x stake respectively. So for example if you were lucky enough to reach 20x and get say 4 wins whilst on it you would also accumulate another 100x your bet! Now it is necessary to see the rewards for the 5-of-a-kind wins as we can assess the potential. Symbols aren't stacked but can appear once, twice or three times on any reel due to the individual icons the cascades drop in. The Pass Go Wilds pay 20x stake as do the game's Logos, then Mr. Monopoly pays 10x stake down to the lowest playing pieces, the boot and cat at 1.2x stake. So a single line of 5 on 20x multiplier can award 400x your bet + 25x bonus and it possible to get more than one line. The game will certainly appeal to fans of Netent's Big Bang which has a similar format.